The Jenkins Power Company, supplying power through kids and puppies. A happy family of three powering it least one household. A draft for the April issue of the Arizona magazine, Kids & Sports from the school. Samantha Jenkins / Class of 2019 A Champion Schools student since Kindergarten, Samantha Jenkins is in the habit of getting it right. Her current third grade teacher, Mr. Allie, describes Samantha as, "a model student." The title is quite fitting since earlier this year Sam became the youngest student ever to attain both the Honor Roll and Student of the Week accolades. What makes her academic feat even more impressive is that Samantha achieved this award while competing in the Champion Schools 2nd-5th Grade Soccer Division and Kickball League. Sam's work ethic, focus and commitment towards perfection personify the Champion mindset and what Champion students strive to develop. She also has a younger brother, Timothy following in her footsteps. There are times when life feels like it is a bit much.. ususally for me it seems it's not something I want ie finances, something breaking. Then there are the times when life is just busy and seems to be overwhelming. I am at one of those overwhelming times.. Currently I am trying to finish a todo list for my side job and getting frustrated because everytime I think about working on one or two of the big items there are a couple of small ones that pop up and eat up my time. I have make a couple of break throughs which help long term but I still want to get the stuff off my todo list and move on. On the other hand I just talked with Sonor Quest labs and got the process started to add another item to my todo list. This will both be helpful but will cause me to implement other changes that we had planned on earlier. I am basicly a backup programmer for a project that doesn't require a full time programmer but when something needs to be fixed and they need it quickly and the main person is not here then it falls on me. Now the program was redone this last year and is now in C#. I can muddle my way though C but I haven't had any formal experience with it. So right now I am currently working my way though a book on programming C# in order to get a better idea on how to read the code and write it. Current deadline for the people useing the program mid September. Also I have undertaken a big project and converting it to .net as well before January. Shhhh Girlfriend.. yes it's true. She is a nurse, 32 and has a 2 year old daughter. Because she works every other weekend I am watching her daughter for her. Kids are back in school. I didn't hear from a Montessori school I was expecting to put Timothy in and so he and Samantha are at the same school. Timothy is not doing the same behaviors as he was last year when we tried this but he is also use to being at a Montessori school vs a traditional one. So we have a issue of schoolwork not getting done. Being up out of his seat, ect. So I have to spend about a hour to a hour and half at night working with him on getting his homework and schoolwork done. I also signed up both kids for soccer starting next week. This means that 4 days a week one or the other will be there til 5:30pm. Not a huge thing but it's a half hour out of getting home, dinner and homework. Also their game are on Sat Mornings from 8am to 11am. I was leary about putting Tim in this since I am trying to get hom back into a Montessori school but hoping it all works out. Trying to find time to spend with her. We have been trying to a lunch a week and then doing something on Friday or on the weekend she has off. I am having a hard time shaking the feeling of being pulled in all directions and wanting a longer day. Ok, please note that in the previous post we had our last dove leave us with her kids. Update....we now have a new dove up there. I am going to assume that it is not the same one, I personally think it is way to soon especially with the young ones. But never the less she has been giving us hard looks. I was still amazed that after today she is still up there. So we will see how it goes..The Jenkins Power Company is now powering a fan again on the back porch via dove. Now for today. It is, ok looks at the time, was Sam's B-Day party/sleepover. I had orginally though that there might be 7-8 people for the party, with it least 6 for the sleepover. Turns out that there were 5 for the party and 3 for the sleep over. The party portion went well. It got off to a late start because we were expecting 3 more, Sam kept saying, 'yes they are coming'. But it went well. I found that for waterballoons having the kids help fill them and the adults tying them off was very fun. The kids had fun and the adults got squirted. We had fun later while playing Uno Attack.. I actually think that it is more fun than regular uno. The girls stayed up very late watching a movie and then doing nails ect. Sam went to bed at 1am. The rest I finally said "Lights out, if you stay up and talk fine, but lights out and doors closed." Needless to say they crashed. Bad for me since I stayed up and talked til 4am and then woke up at 7am. Sam was up shortly there after. Don't you love us morning people. Well we had a dove take up the nest that is out on the back porch. I didn't think to much off it. She just looked at us as we went in and out. About a week ago I finally confirmed that the did lay some eggs and that they did hatch. The young ones were so quiet that we didn't hear them. They were already big enough that this week the mother left the nest a couple of time. The next thing we knew the nest was empty. I also have a bell shaped thing of bird seed that we have hung out there as well, along with a humming bird feeder. Well the bell is mostly gone and I though I would replace it with a regular bird feeder, especially one that more than one bird could be on... ya know pecking order(grins). So Grandma Bess had purchased on and given it to us. I put it out yesterday. At one point when I looked there were about 12 birds feeding on or around it, mostly sparrows. I also saw a couple of doves again on the ground. So looks like for now were are a popular place with the birds. Ok I have been working on the website for the place that I work on and off for about a week now. Working on a page that hopefully can go out shortly public and then having someone help us with a new menu. So I redid a webpage so that it used the same code for the rest of the site on the menu system and that it was able to swap out the picture on the top as well. We had one of our web consultants help us with a new menu. So I had to pull the old code and redo it on 3 web sites. So needless to say I am tired of doing web coding for the week and I hope not to get back to doing more for it least a couple of days. So I go by my side job this morning to drop off a scanner that I had for the weekend for testing. As I am walking in the manager says, "I can't get to the database or the internet." I asked if it was just one computer or all of them. We walk in the computer room and I see one switch for the network up and running. I look up for the other one by the patch panel and there are no lights on. I go oh no not the main switch! Try two power cables and a couple of different outlets and nothing. So talking to the network consultant and he says it's dead and to get a new one. So I run down to the store that I know has a 24 port switch and get a new one. I get back and the old one is on but they can't get anywhere. So I take down the old one and install the new one. It's fun swapping all 24 patch cables from the old to the new. I also had to re arrange a couple of things so that the new switch would plug into one of the upses that there, I think this may have possibly been the issue as they have enough power outages ect. due to the area. Needless to say I got to work late and it was a fun morning. Well we had a great weekend and I was reminded that Arizona does have a spring. 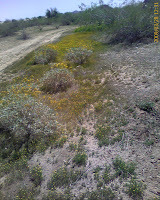 The flowers that Grandma got us and we planted around one of the palo verde in the back are slowly coming up, 6 so far. I have some flowers that are coming up for humming birds/butterflies. 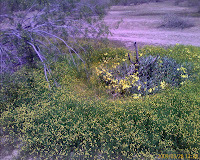 And I stepped outside and look at one of the palo verde out front and it was in bloom. It looked so great I had to take a picture of it. Included are some pics of the Phoenix Rock Art Center where we went Saturday as well.